A few years ago on holiday in Paris, my daughter and I were walking along the Seine from the Musée D’Orsay (we’d hoped to get in, but the staff were on strike), heading for the pedestrian bridge that crosses the Seine to the Jardins des Tuileries, when a woman walking a few paces ahead of us suddenly exclaimed, bent down and stood up with a gold ring in her hand. Eyes wide with amazement she turned to us, and asked us (in French) if we thought it was real gold? Light dawned. I said to my daughter in English, ‘It’s a scam.’ But it had been so clever, so well-acted, I had to grin. The woman saw; she grinned too, but her hand was out and her eyes were fixed on my face. I opened my purse and gave her a couple of Euros – enough for a coffee – which she took without fuss. We kept the ring as a cheap souvenir and crossed the bridge. A hundred metres along the other bank, another woman waved at us. ‘Regardez ce que j’ai trouvee! - Look what I’ve found! A ring! Is it real, do you think?’ We laughed at her and passed on. Paris that day was bursting with women doing the ring trick and clearly the way it was supposed to work – and must actually have worked a significant proportion of the time – was by a form of emotional blackmail. The victims examine the ring, find the hallmark and pronounce it real. A ‘valuable’ ring is then ‘gifted’ to them, plunging them into confusion. The request for money, an apparent after-thought, takes them by surprise and is hard to refuse. Some people may well have paid the scammer a fair percentage of what they felt the ring was ‘worth’... Last time I went to Paris, the scam of the moment seemed to be card tricks – men doing ‘Find the Lady’ on the Rive Gauche and under the Eiffel Tower, surrounded by small crowds of the fascinated and unwise, who may later have discovered their pockets had been picked. There is nothing new under the sun. I feel sure the ring trick was probably being played in Babylon and Ninevah. 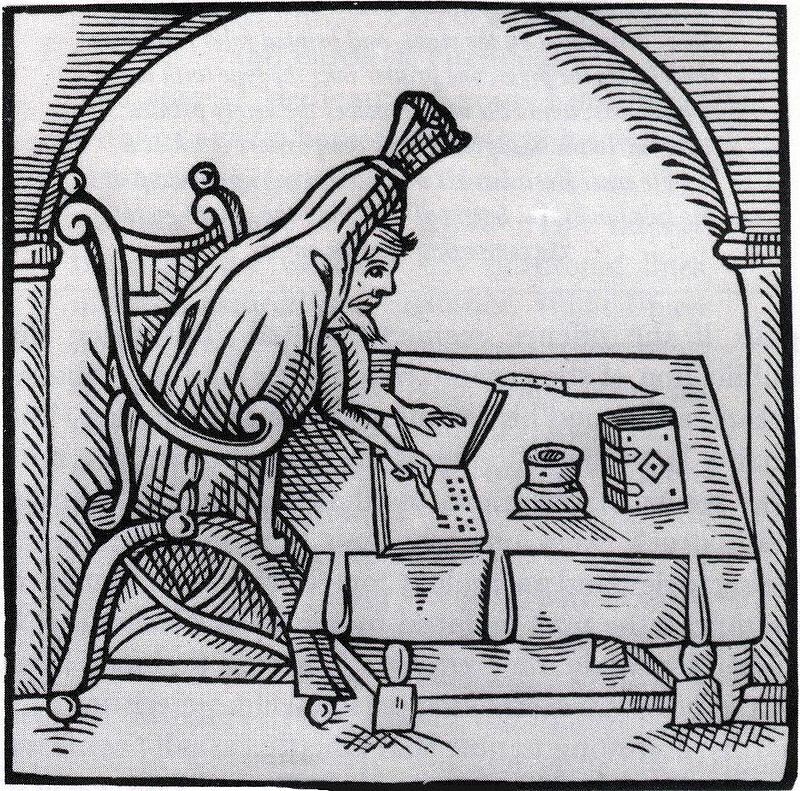 Certainly in Tudor England, the honest countryman coming into London on business was in grave danger of being fooled and robbed. 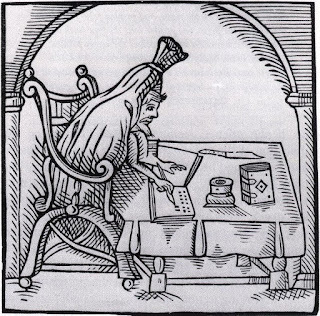 The journalist Robert Greene wrote an exposé of them in his 1591 pamphlet ‘A Notable Discoverie of Cozenage’. 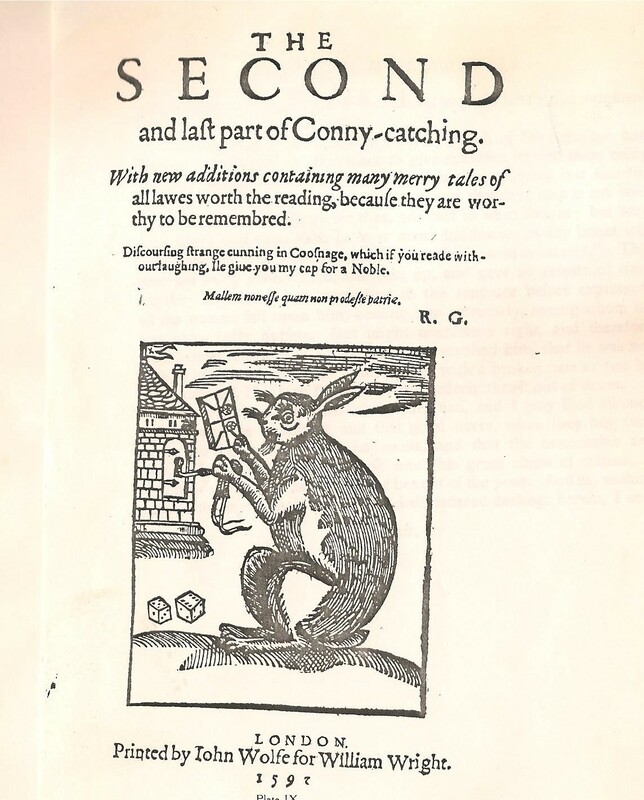 ‘Cozenage’ means ‘trickery’, and the scams were known as ‘Cony-catching’. The conies, or rabbits, were the simple victims. The coney-catchers were the gangs of scamsters. Here’s some of what Greene had to tell of their methods and how they struck up an acquaintance with their victims! ‘Why sir,’ saith the setter, guessing by his tongue [accent] what countryman he is, ‘are you not such a countryman?’ If he say ‘Yes’ then he creeps upon him closely. If he say ‘Nay’, then straight the setter comes over him thus: ‘In good sooth sir, I know you by your face... I pray you, if without offence, let me crave your name and the place of your abode.’ The simple man straight tells him where he dwells, his name and who be his next neighbours, and what gentlemen dwell about him. These cony-catchers, these vultures, these fatal harpies that putrefy with their infections the flourishing estate of England ... stand upon their bravadoes ... swearing by no less that their enemies’ blood, even by God Himself, that they will make a massacre of his bones, and cut off my right hand, for penning down their abominable practices. But alas for them, poor snakes! ... every thunder-clap hath not a bolt, nor every cony-catcher’s oath an execution. I live still, and I live to display their villanies, which, Gentlemen, you shall see set down in most ample manner in this small treatise. Be that as it may, Greene died the same year on 3 September 1592, aged only 34. He died not from violence (we’d probably have known about that) but, according to scholar and rival pamphleteer Gabriel Harvey, from ‘a surfeit of pickle herring and Rhenish wine’. The rather spiteful Harvey also claimed in his ‘Four Letters and Certain Sonnets’, December 1592, that Greene kept a mistress, "a sorry ragged quean” and the sister of a criminal known as "Cutting Ball" hanged at Tyburn. 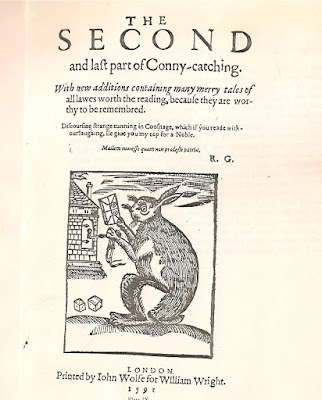 If true, then the ‘Cony-Catching’ pamphlets were truly drawn from the low-lifes with whom Greene and many another minor Elizabethan writer knocked about. They are vivid and amusing pictures of the rough streets, ale-houses and back-alleys of Tudor London. Loved your account of meeting the Parisian coney-catcher - and glad that you're too wise a coney to be caught. These tricks never go away, do they? I bet that the internet favourite, that appeal for help in moving money from one country to another and if only you'll let them use your bank account, etc, etc - was also played in previous centuries. The details would have been different, but the con the same. Once in London, I had a lady try to sell some 'lucky heather' to me - me, a girl from Scotland!